Wearable technology is growing in popularity and Jastr is showing us why. Their up-and-coming products such as their smart water bottle or their app Finch, is not just valuable for your health provider, but for yourself as well. With this new health technology, you can feel all the more comfortable that you are responsibly monitoring your health as best you can. Managing Partner Chris Ha takes us through the startup, its plan, and why the future of health is here. 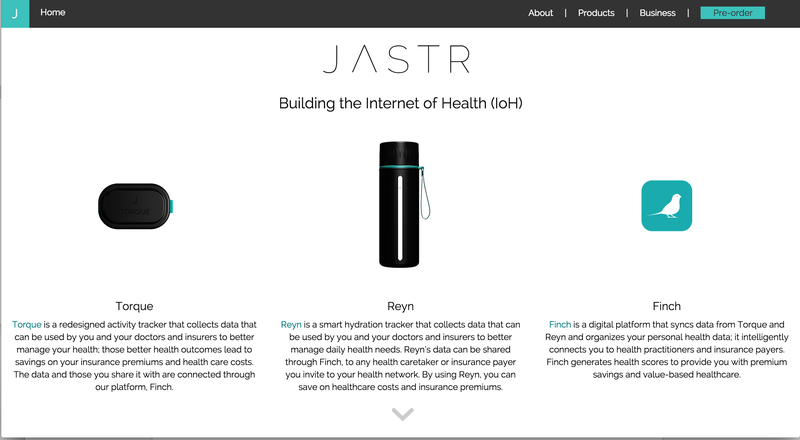 Jastr is building the Internet of Health, a system that links our devices to the Internet via our free App, Finch, to better your health. Torque is a wearable tracker. It monitors daily activities, sleep patterns, and can be used to monitor concussions, falls, hits, and recovery needs. Reyn is a smart bottle that tracks consumption; it may be used for hydration, nutrition, drug regimen, and productivity. Our devices are actually IoH enabled health programs that help consumers take control of their cost savings and health outcomes. Our devices are the future of health programs: holistic, data-driven, and personalized. Likewise, we simplify the process for insurance, health benefits providers, underwriters, and practitioners to build a digital relationship with consumers and increase their value add to their constituents. We are targeting a piece of the Internet of Things (IoT) market which is forecasted to be a $19T market by 2020 (Source: Cisco); more specifically, digital health and IoT is 1.2% of the IoT market and is forecasted to be a $233.3B market by 2020 (Source: Statista). Within this landscape, our serviceable addressable market of users (athletes, college students, maternal care, geriatrics) who would most likely use our products and services account for 1-2% of the digital health market; within 5 years, Jastr aims to serve this sub-market and develop a profit of 1 billion and upwards. We believe that the Internet of Health and Embedded Systems can change the economics of profit and scale in healthcare. Our devices are sold at cost. Our platform, Finch, is free. There are small transaction fees for connected services across levels of care (binary, primary, secondary, tertiary, and quaternary care products and services). Think the ‘Amazon Kindle of Health’: low-cost hardware, embedded SaaS, and transactions that drive consumers to change current industry economics; Amazon Kindle did this for e Publishing. Working at the intersection of our skills and our passions. The team that is leading the development of the Internet of Health and subsequent IoH machines have years of experience in hardware systems, full stack engineering, human-computer interaction, industrial engineering, medical technology, biotechnology, financial analysis, and other disciplines. Building all things IoH @ JastrHQ is an expression of their technological, scientific, and design instincts, and ideals. We aim to finish closing our core strategic and operating partners and ship our commercial hardware products in Q1-2016. By leveraging our current traction, we would like to start implementing technology campaigns on the ground in 30 universities and with our first seven partnerships throughout the US. We also have interest in Britain to explore a pilot program with their leading nursing and geriatric care facilities. I never received this advice about Availability-Misweighing Tendency directly, but it is from a book that I constantly reread (The Psychology of Human Misjudgment): “The great algorithm to remember in dealing with [this] tendency is simple: An idea or a fact is not worth more merely because it is easily available to you.” When information is readily available, human nature has a tendency to put greater emphasis on the value of said information. It is not only unavailable information that is underweighted as a result, but rather, information that the brain cannot remember or is blocked from using because it was influenced by another tendency. The moral of this tendency is to understand that an idea/fact is not worth more simply because it is available. Jamie Dimon of JPMorgan Chase because JPMC is the largest commercial bank in New York. 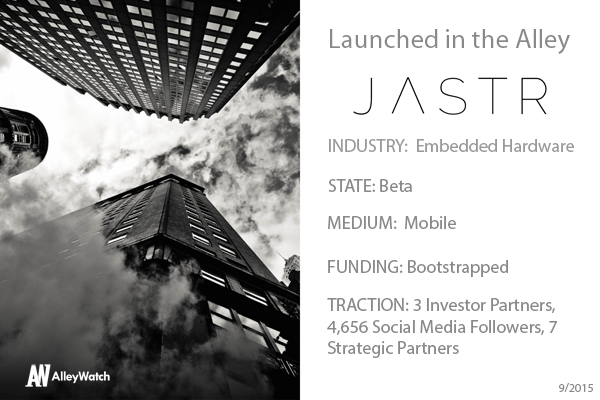 Jastr is building IoH technology that merges with fintech – the commercial space will move faster than insurance providers when it comes to innovation. If we can get banks behind the idea of more personalized healthcare banking, we could replace insurance companies and become a model that every other country that has banking (all of them) to follow. When comparing systems with the U.S.: banking systems around the world operate more in parallel with our banking system than our health insurance systems — not because our banking system is superior (and thus should be mimicked) but rather because fiscal and monetary exchange is more homogenous across systems. Why did you launch in New York? New York is the fastest growing market for financial-technology ventures in the U.S.; investment is set to double by 2018 (Source: Accenture). Everyone loves an underdog story — the investment in startups to catch up with other startup ecosystems such as Silicon Valley is coming from government, academia, real estate investors, and local businesses. If New York merges its effort to be a leader in fintech with their incremental lead in investments in digital health, it can easily become a flourishing startup scene with core competences in these two areas. As a company working at the intersection of technology, finance, and design for healthcare: there’s no better place than to be an underdog within an underdog state to prove naysayers wrong and do the impossible. What’s is your favorite restaurant in the city? Le Philosophie; it personifies a love and passion for philosophy, obscurity, French ancestry/culture, style, classical antiquity, and New York City pace + existentialism. It is a welcoming safe haven for critical thinkers, a home for the outsiders, and for those who like intricate details without the pretension. Next What the Hell Happened to Reddit?